[Updated] "Good Morning America" reporter Claire Shipman on Friday worried that Al Gore's occasional kind word about John McCain might result in the election of the Republican. Interviewing the former vice president about his new energy proposals, the ABC correspondent fretted, "...And some Democratic eyebrows have been raised at your praise of John McCain. Democrats worried that maybe you're, you're going to help him get elected." Shipman simply fawned over the Democratic politician and cooed, "Many people are also talking about the fact that you would make an incredibly effective environmental czar either for Barack Obama or John McCain. Is that the sort of job that would interest you?" The MRC's Brent Baker covered the similarly fawning coverage on the July 17 newscasts of CBS and NBC. 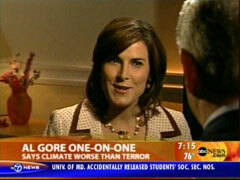 Gore also appeared in the 7am hour of NBC's "Today" show. In contrast, reporter Anne Thompson actually asked Al Gore some tougher questions, such as the logical query, how does he plan on accomplishing his energy goals? THOMPSON: I asked Gore if in watching Obama and McCain he feels a little bit like retired Packers' quarterback Brett Favre. Does he regret not running again, not getting in the game? He said, no. There are thing he misses about politics and things that he doesn't, but says his job now is to change people's minds about the climate crisis, Ann?